Art Nouveau Ornaments – Graphic Design, Art deco Period 1910. Art Nouveau Ornaments – Graphic Design Art deco Period 1910. Illustrations, Decoration with Tendrils and Waves. Floral design. Design by Alfons Mucha. Gallery: Art nouveau, decorative arts by Alfons Mucha. Art Nouveau Design Plate – Art deco Period 1910. Art Nouveau Design Plate – Art deco Period 1910. Illustrations, Decoration with flower tendril, floral motifs, abstractforms. Floral design. Graphics by Alfons Mucha. Gallery: Art nouveau, decorative arts by Alfons Mucha. 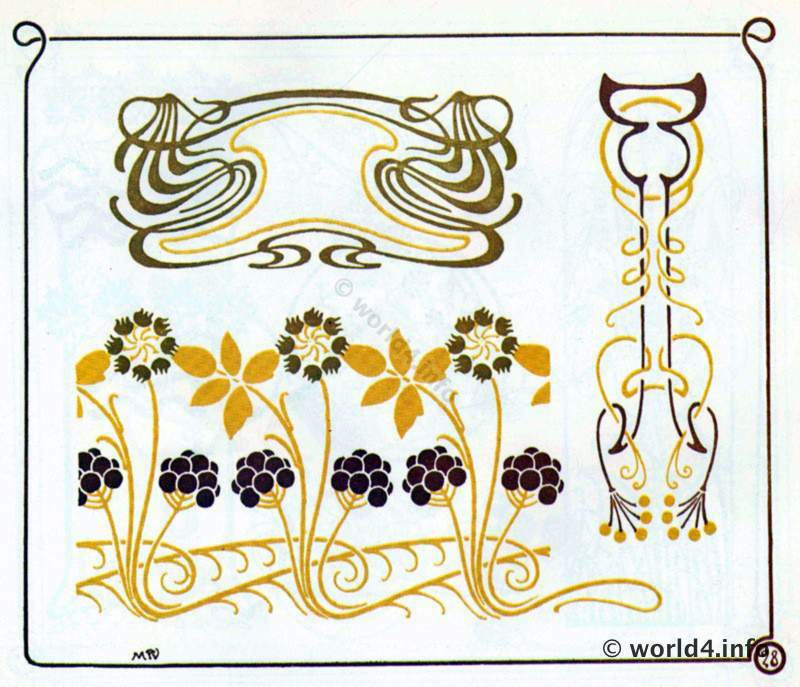 Art Nouveau Ornaments – Graphics Design Art deco Period 1910. With poppy, flowers and leaf shapes. Gallery: Art nouveau, decorative arts by Alfons Mucha. Art Nouveau Ornaments by Alphons Mucha. Plants, flowers. Art Nouveau Ornaments – Graphic Design Art deco Period 1910. Art Nouveau Ornaments Illustration. Decoration with flowers tendrils, Leaves, Floral motifs. Design by Alphons Mucha. Gallery: Art nouveau, decorative arts by Alfons Mucha. Flower Tendrils. Alfons Mucha – Art deco Period 1910. Alfons Mucha – Graphic Design Art deco Period 1910. Art Nouveau Ornaments – Graphic Art deco Period 1910. Illustrations, Design Decoration with leaves, plants tendrils, flowers, floral. Graphics by Alfons Mucha. Gallery: Art nouveau, decorative arts by Alfons Mucha. Art Nouveau Ornaments – Graphic Art deco Period 1910. Illustrations, Design Decoration with leaves, waves, plants tendrils, flowers, floral. Graphics by Alfons Mucha. Gallery: Art nouveau, decorative arts by Alfons Mucha.